ONE Championship will be bringing out the big stars when they make their maiden trip to Japan this 2019. The Singapore-based martial arts promotion announced six massive bouts, including three world championship contests set to take place at ONE: A NEW ERA in Tokyo, Japan on 31 March 2019. In a highly-anticipated ONE Women’s Strawweight World Championship bout, reigning champion “The Panda” Xiong Jing Nan of China meets undefeated women’s mixed martial arts star and reigning ONE Women’s Atomweight World Champion Angela “Unstoppable” Lee of Singapore in a massive champion-versus-champion matchup. Xiong and Lee were initially supposed to cross paths at ONE: HEART OF THE LION in Singapore back in November, but an injury forced Lee out of the bout. This coming March, Xiong has the opportunity to establish herself as one of the most dominant martial artists in ONE, while Lee can make history by becoming the first female two-division champion in history. Myanmar’s favorite son and reigning ONE Championship Middleweight and Light Heavyweight World Champion “The Burmese Python” Aung La N Sang puts his middleweight title up for grabs when he meets Japanese contender Ken Hasegawa in a rematch of their 2018 meeting. In their first encounter, Aung La N Sang and Hasegawa put on an instant classic, nearly going the full-five rounds before Aung La N Sang scored a late fifth-round stoppage to keep hold of his title. Now, Aung La N Sang and Hasegawa go head to head once more to compete for the top spot in the middleweight division. The third world championship bout of the match features another much-awaited rematch between two of the lightweight division’s biggest stars, as reigning ONE Lightweight World Champion Eduard “Landslide” Folayang defends his title against a familiar foe and a former champion in Japanese martial arts legend Shinya “Tobikan Judan” Aoki. 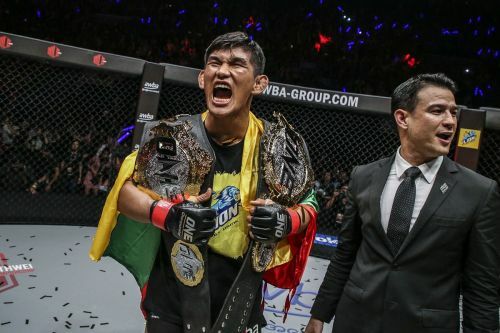 Folayang shocked the world when he and Aoki first crossed paths back in 2016, stopping the long-time champion via TKO and capturing the ONE Lightweight World Championship for the first time. Now on his second run as the top guy in the lightweight division, Folayang looks to repeat history, while Aoki seeks retribution in his hometown. In a ONE Super Series Muay Thai bout, icon Yodsanklai IEW Fairtex of Thailand faces Andy Souwer of the Netherlands. ONE: A NEW ERA will take place at the Ryogoku Kokugikan in Tokyo, Japan on Sunday, 31 March.